Venezuela is in the throes of a classic Hybrid War, and analyzing the indirect adaptive approach to regime change being applied there can be instructive for identifying and understanding similar processes whenever they unfold elsewhere. 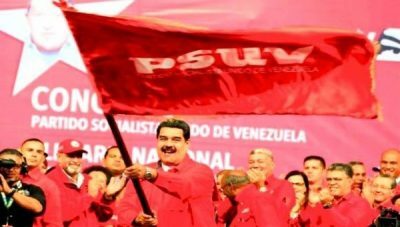 The Hybrid War on Venezuela is reaching its climax following the preplanned and coordinated provocation of the US and its “Lima Group” allies to recognize Juan Guaidó as the country’s “interim president” after he swore himself into office on the day that the Bolivarian Republic celebrated the 1958 ouster of a former strongman. The symbolism is intentionally designed to send a message to the Venezuelan people that Maduro will be their next leader to be overthrown, as well as signal to the international community that “the people are rising up against the regime”. This didn’t just happen out of the blue, however, but is the culmination of the US’ carefully calibrated regime change strategy over the years that follows the model laid out by the author in his similarly titled 2015 book, “Hybrid Wars: The Indirect Adaptive Approach To Regime Change”. All Hybrid Wars aim to achieve something of strategic significance, and in the Venezuelan case, the US wanted to advance its geopolitical objective of totally controlling the Caribbean, its ideological agenda of overthrowing a socialist government, and its economic one of controlling the world’s largest oil reserves in the Orinoco Belt. The US imposed sanctions and utilized other forms of coercion against Venezuela in order to undermine its macroeconomic development, which was doubly effective because these disruptive measures were timed to coincide with the oil price crash that made it impossible for the state to continue its socialist model of wealth redistribution without reforms. It’s to be expected that no government is capable of perfectly managing any adverse situation that comes its way and Venezuela is certainly no exception, but the US weaponized Maduro’s mismanaged response to Washington’s Hybrid War on his country through infowars and other psychological influence operations in order to encourage unrest. After having clandestinely cultivated Color Revolution cells inside the country and abroad, the US blew the dog whistle to order them into the streets from time to time in response to certain “trigger events” such as what its Mainstream Media portrayed as “disputed elections”, all in order to catalyze a self-sustaining cycle of Hybrid War unrest pitting “civilians” against the state. Simultaneously with the advanced stage of Color Revolution cultivation, the US took advantage of Maduro’s initiative to create the Constituent National Assembly in order to have the National Assembly function as a parallel governing structure under the influence of Washington and foreign-based regime change figures. The next foreseeable step is for the US and its allies to “justify” their further intervention into Venezuela’s domestic affairs on the pretext that their designated proxy Guaidó (or his possible “successor” if something happens to him) might request “additional assistance”, which will likely be covert but could also take on conventional dimensions in the worst-case scenario. As can be seen, the US carried out surgical interventions at crucial stages of the Hybrid War on Venezuela, with each one being intended to escalate the situation in parallel with various acts of terror. Regrettably, there is no “ideal solution” since both sides are “playing for keeps” and it’s literally all or nothing to each of them. “Compromising” for the so-called “greater good” might embolden the foreign-backed “opposition” to “go in for the kill” just like what happened in February 2014 with the spree of urban terrorism popularly known as “EuroMaidan”, though Maduro might come to conclude that this outcome is “unavoidable” if put under enough pressure and could therefore “peacefully accept” to participate in a “phased leadership transition”. On the other hand, he and the military might fight it out to the end if they believe that they have the majority of the population on their side, just like President Assad did under comparable circumstances, though nevertheless possibly portending a similar outcome of a prolonged conflict and what might turn out to be one of the world’s worst humanitarian crises. In any case, nobody should get their hopes up about Russia commencing a military intervention in support of Maduro like it did for Assad. It’s impossible for Russia to maintain the cross-Atlantic supply lines necessary for such a feat given that the US has total control over the air and sea domains in this space. The most that it could probably do is dispatch emergency shipments of various weapon systems, but even that’s only relevant when it comes to deterring conventional aggression and has almost no impact on countering hybrid threats such as those posed by Color Revolutions and urban terrorism. Rhetoric aside, Russia’s only real interests in Venezuela are in ensuring that its billions of dollars in loans are repaid and that Caracas respects the energy and military deals that it previously signed with Moscow. Russia would certainly take a financial hit if the US’ regime change operation succeeds and the subsequent coup “authorities” cancel these agreements, which is why it might try to “pragmatically compromise” with the “rebels” if they appear to be on the brink of victory.